The Riverside Sanitary Trunk Sewer serves those areas of Dublin on the east side of the Scioto River and drains into the City of Columbus sanitary sewer system through the Upper Scioto East Interceptor Sewer. The remaining six tributary areas located on the west side of the Scioto River drain to the Upper Scioto West Interceptor Sewer. 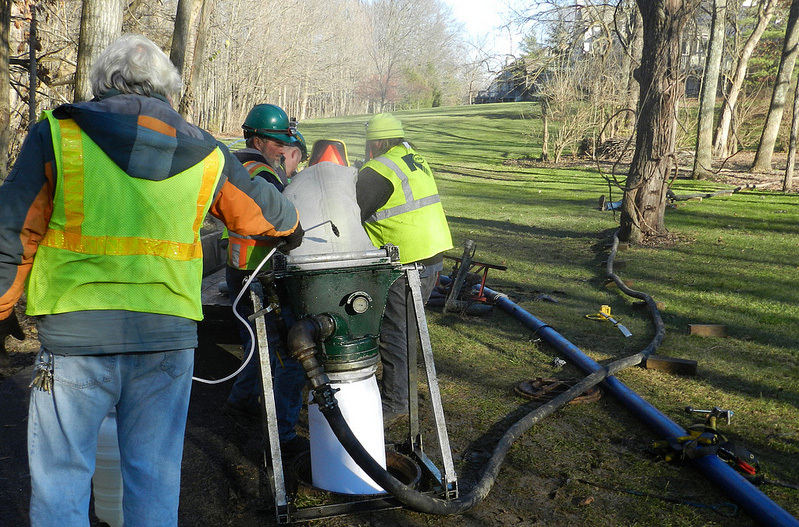 The Upper Scioto West Interceptor is the latest major improvement to the sanitary sewer system. The $21.7 million ($18.7 million funded by the City of Dublin and $3.0 million by the City of Columbus) project was undertaken to relieve many system deficiencies and provide the sanitary sewer system adequate capacity necessary to meet future wastewater demands. The sanitary sewer collection system consists of more than 225 miles of sanitary sewers and 5,537 sanitary sewer manholes. One sanitary sewer pump station along with approximately 3,500 feet of sanitary sewer force main complement the system to provide service to areas in the Riverside Sanitary Sewer Tributary areas where gravity service is not feasible. This pump station is located along the east side of Riverside Drive between Summit View Road and Wyandotte Woods Boulevard. The City of Dublin currently generates an average of approximately 6 mgd of wastewater that drains to the City of Columbus sanitary sewer system for ultimate treatment and disposal. The existing and future conditions of utility infrastructure can be evaluated by applying the sanitary sewer flow and water demand estimates into hydraulic computer models. For each sanitary sewer tributary area, a computer model was created and populated with information from documented as-built construction drawings. Since the 2007 Community Plan was completed, additional improvements and additions to utility infrastructure have taken place. Improvements performed range from major capacity enhancements to repairs in aging infrastructure. These improvements and additions were researched and added to the utility computer models. Existing and future sanitary sewer flows were developed for input into the sanitary sewer model. Existing flows for the model were created using a combination of existing house counts and sanitary sewer flow meter data to establish a daily flow pattern. Using standard design criteria and future uses discussed in the Land Use Chapter, the future flows were estimated and entered into the model. Existing and future impacts to the sanitary sewer system were then evaluated to ensure that necessary capacity is available to transport wastewater flows. The OEPA DFFO requires that the City perform a Sewer System Evaluation Study (SSES). The City has opted to do this study in phases over a 15-year time frame. This study requires gathering field data and performing hydraulic analysis of the sewer system. Each of the existing sewer sheds models use updated data based on the schedule approved by the OEPA. The narrative for the watersheds is updated as continued modeling is performed. An analysis of the sanitary sewer system based on the proposed greater densities within the Bridge Street District that were not considered in previous modeling found that the trunk sewers that serve this area (Deer Run, North Fork Indian Run, South Fork Indian Run and Riverside) were adequate to serve the proposed development plan. Only minor improvements to the rest of the system are otherwise required. The Deer Run Sanitary Sewer Tributary Area currently serves approximately 3,350 acres of developed land within the City of Dublin. Existing development within the Deer Run produces a peak daily sanitary sewer flow of approximately 5.60 MGD, and the main trunk sewer is experiencing problems under existing conditions. Currently there are two separate areas where the sewer has reached its hydraulic capacity: the Dublin Road Siphon and Kilbannan Court Capacity Constraint. The Deer Run Trunk Sewer just north of the intersection of Dublin Road and Reserve Drive has reached its hydraulic capacity under existing conditions. The location of the capacity problem is the former site of the Deer Run Pump Station. Currently there are parallel 15-inch sewers acting as a siphon and emptying in a 36-inch sewer under Dublin Road. The majority of the flow from the Deer Run Sanitary Tributary Area passes through these parallel sewers. The 15-inch sewers are not capable of handling additional flow and improvements to this area are necessary. The Deer Run Trunk Sewer just south of Kilbannan Court is also exceeding its hydraulic capacity under existing conditions as it passes through the Muirfield Village Golf Course where the 12 inch diameter pipe is reduced to an eight-inch sewer. This bottleneck may cause the sanitary sewer to surcharge during peak flows under existing development conditions. Although the Deer Run tributary area is mostly developed, there are small areas that still have the capacity for development and/or redevelopment. Using the proposed future land uses, approximately 5.67 MGD of total peak sanitary flow will be generated in this watershed. No additional sections of the sanitary sewer system appear to be affected by this additional sanitary flow. However, additional growth in the Deer Run sanitary sewer system will worsen capacity problems at the Dublin Road Siphon and Kilbannan Court area. The current condition of the sanitary sewer system will prohibit additional growth in this area until the identified deficiencies are corrected. As required by the OEPA DFFO, additional modeling has been done for this tributary area and upgraded to a dynamic model including all pipes, This new model validated the findings of previous work and provides additional insight for managing the identified issues. Proposed improvement projects will be carried into future capital improvement programs to resolve these issues. In 2012, the City undertook a large sewer lining project within this tributary. The age and pipe material of the sewers in this area has allowed more than usual amounts of rainfall and groundwater to enter the system. The more durable pipe linings restore the structural integrity of the pipe and reduce the amount of inflow and infiltration of rainfall and groundwater. Additional reduction of inflow and infiltration from repair and maintenance of house services may be necessary to continue to further improve the conditions of this sewer tributary area. The North Fork Indian Run Sanitary Sewer Tributary Area serves approximately 3,030 acres of developed land within the city. Existing development within the North Fork Indian Run produces a peak daily sanitary sewer flow of approximately 4.91 MGD. While there are no capacity issues under existing peak conditions, the sanitary sewer is gradually reaching its allowable capacity. The North Fork Indian Run Sanitary Tributary Area has significant undeveloped land. The previously defined tributary area encompasses a large portion of the Negotiated Service Area. Future land uses produce sanitary sewer flow projections of approximately 10.09 MGD, and the service area for the North Fork Indian Run Sanitary Sewer System would more than double in area, from 3,030 acres to 6,900 acres, thus creating many capacity issues. The main trunk sewer exceeds capacity in the general area of Dublinshire Drive and Cashel Court to the trunk sewer’s terminus near Dublin Road. This represents approximately 9,000 feet of 24-inch sanitary sewer. Major sanitary sewer improvements will be needed to serve expected build-out in the area. The South Fork Indian Run Sanitary Sewer Tributary Area currently serves approximately 2,300 acres of developed land within the city. Existing development within the South Fork Indian Run produces a peak daily sanitary sewer flow of approximately 3.91 MGD. Under existing peak conditions there appears to be no capacity issues. The additional area to be served by the South Fork Indian Run Sanitary Sewer System is approximately 1,920 acres. The future land uses in this watershed are projected to produce sanitary sewer flows of approximately 8.56 MGD. To accommodate the additional flow, approximately 4,000 feet of sanitary sewer will need to be improved. The Cosgray Sanitary Sewer Tributary Area currently serves approximately 1,210 acres of developed land within the city. Existing development within the Cosgray produces a peak daily sanitary sewer flow of approximately 1.68 MGD. The trunk sewer under existing conditions appears to be performing well with additional capacity available throughout the system. The future land use plan indicates an additional 530 acres of area that would be served through the Cosgray Sanitary Sewer System. These uses would produce approximately 3.24 MGD of sanitary sewer flows. The model results show the Cosgray Sanitary Trunk Sewer has sufficient capacity to serve the land uses as proposed. The Cramer North Sanitary Sewer Tributary Area currently serves approximately 1,175 acres of developed land within the City of Dublin. Existing development within the Cramer North produces a peak daily sanitary sewer flow of approximately 1.45 MGD. The trunk sewer under existing conditions appears to be performing well with additional capacity available throughout the system. Based upon expected future development within the city’s planning area, an additional 675 acres of land is to be developed in the Cramer North Sanitary Sewer Tributary Area. The sanitary sewer flow produced would be approximately 3.43 MGD, within the capacity to accommodate proposed future land uses. The Cramer South Sanitary Sewer Tributary Area currently serves approximately 515 acres of developed land within the city. Existing development within the Cramer South Tributary produces a peak daily sanitary sewer flow of approximately 2.69 MGD. The trunk sewer under existing conditions appears to be performing well with additional capacity available throughout the system. Under the Future Land Use Map, an additional 825 acres of land is to be developed in the Cramer South Sanitary Sewer Tributary Area. This would produce a sanitary sewer peak flow of approximately 3.20 MGD. Under these conditions the system is capable of meeting the needs of future growth in this sanitary sewer tributary area. The Riverside Sanitary Sewer Tributary Area currently serves approximately 1,320 acres of developed land within the city. Existing development within the Riverside Tributary produces a peak daily sanitary sewer flow of approximately 3.53 MGD. The trunk sewer under existing conditions appears to be performing well with additional capacity available throughout the system. The future land use plan identifies an additional 716 acres of land to be developed in the Riverside Sanitary Sewer Tributary Area. This produces a total sanitary sewer peak flow of approximately 6.27 MGD, which is within the service capacities of this tributary. Four sewer tributary areas are used to provide sanitary services to the Bridge Street District: Deer Run, North Fork Indian Run, South Fork Indian Run and Riverside. The static models for these areas were updated in 2011 to reflect newer flow metering data, any new development not reflected appropriately in the previous model and the proposed densities for the Bridge Street District. No immediate operational issues were identified that were caused by the proposed level of development in the District. The estimated additional flows by the proposed land use will not change the performance of the existing system. Additional sewer infrastructure will be needed by proposed developments within the District to provide service to their buildings. The additional area proposed to be serviced through the City of Dublin’s sanitary sewer system represents an additional 17.0 MGD in peak wastewater flow. Table 9.2 summarizes the peak sanitary sewer flows determined through modeling, where three watersheds have limitations on their ability to serve additional growth. The Deer Run Sanitary Sewer System has reached its allowable capacity and will require sanitary sewer improvements to accommodate additional growth. The North Fork Indian Run Sanitary Sewer System is not capable of serving the currently defined tributary area. Additional modeling and analysis will be needed to identify the maximum area that can be served. Alternatives should be considered to identify options to provide sanitary sewer service to the remainder of the Negotiated Service Area. The South Fork Indian Run Sanitary Sewer System will require capacity improvements to handle wastewater flows expected by the Future Land Use Map. Alternatives should be developed to identify the level of improvements necessary to provide sewer service in this watershed. All projections are based on the densities determined as part of the 2007 Future Land Use Map. Significant alterations to these densities could affect the ability of the City to provide for resulting wastewater flows. The above narratives for each watershed will be revised as updated modeling is performed, as required by the OEPA Director’s Final Findings and Orders.